I have recently thought a lot about the idea and significance behind wedding vows. A vow is a formal and sincere declaration made from one person to another (or group of people) where the person commits to an action, role, or behavior. A marriage vow is when a bride and groom publicly pledge their love and commitment to one another for the rest of their lives. In the earliest history of marriage, the father of the bride and the groom verbally agreed upon the marriage, vowing to carry it out. The traditional verbiage that we think of today, that has the wording, “to love and to cherish, in sickness and in health, until death does us part…” can be traced to the medieval church in England. The marriage service was in the first Book of Common Prayer, which was published in 1549. The Marriage Act of 1753 passed in England and Wales, became the first enactment requiring an official ceremony that would legally bind the marriage, before this, the bride and groom just needed to consent to the marriage that acted as a verbal contract. 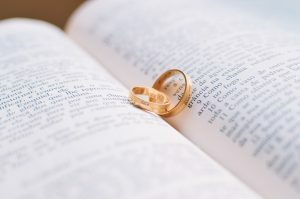 Marriage vows have evolved over the years; initially, the bride promised to, “Love, cherish and obey” however, with the rise of women’s rights many churches eliminated the word “obey.” In modern-day, many couples choose to write personal vows or say a variation of the traditional vows. Modern or traditional, the vows are the most important part of the wedding day. The words you speak bind you to the other person and serve as the foundation for your relationship. It is unfortunate that this part of the wedding day is often rushed to get to the celebration afterward. One theory I have as to why the vows are rushed and in some cases, their meaning overlooked is because the words do not resonate with the speaker. 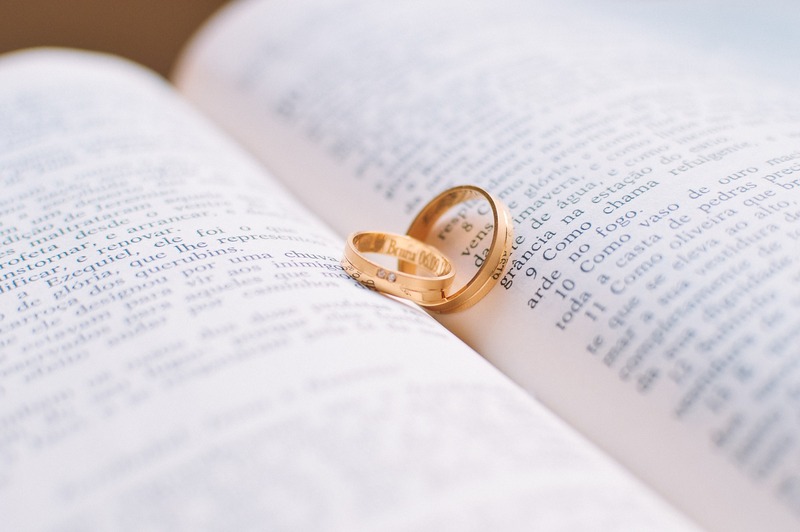 Personally, I felt the traditional wedding vows didn’t capture my feelings toward our commitment, which is what lead Bernard and me to construct wedding vows that were made up of what he and I considered essential to our marriage. I will speak more to that in a minute. You cannot force someone to do, behave, say, commit, change, anything unless that person wants to do it. A person is more willing to do, act, speak, commit, change, something if it was thought of and developed by that person. How do the themes above apply to wedding vows? A bride and groom in most wedding ceremonies will speak vows to one another. However, nothing is forcing them to abide. 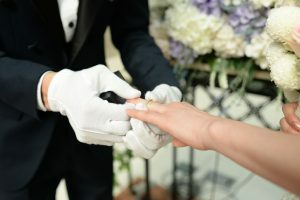 If the bride and groom are saying traditional vows with words that hold little meaning for them, the words will more easily fade from their memory as the years go on. Please do not misunderstand, I am not suggesting, that the sole reason one would choose to break his or her vows is that the words did not carry meaning on their wedding day. I am aware a variety of reasons could cause a person to break their promises. What I am proposing is that if a bride and groom made pledges to one another that were made up of ideas and beliefs that they both agreed were most important, they would feel more allegiance towards them. It should come as no surprise if you have read any of my previous posts what I am going to suggest next, which is to discuss with your significant other the vows you are going to say and what they mean to each of you. By doing this, you are ensuring that the vows hold significance for both of you. The conversation also allows you both to understand how one another feels and what the expectations are for the future of your marriage. I mentioned earlier that I was not a big fan of the traditional wedding vows. After Bernard and I spoke, we both decided we did not like the idea of each of us writing our own to recite. We had gone to other weddings where this was done, and it always seemed like one person wrote more than the other, and one person seemed to get more sentimental. Therefore, we decided that instead, we would say the same vows but the content would be what Bernard and I felt was most significant to us. I felt an emphasis on the idea of choice was important. I thought it was necessary to express that despite there being other possibilities for our life paths that on our wedding day we were choosing the other and doing so without any reservations. We discussed what we needed and expected from one another, all of which we had already been doing for the last eight years. Still, we felt publicly stating them to one another helped to solidify them as tenets of our marriage. Bernard and I agreed to omit “…until death do us part / all the days of my life” language from the vows because we felt it was redundant. The idea of marriage is to be together for the rest of your life; we thought it was unnecessary to verbalize to one another what we both already understood about our matrimony. We concluded our vows by expressing what we knew to be true, from then on, we were bound together, our lives forever intertwined. While Bernard and I have not experienced many trials and tribulations that would test our vows in the last two years, I find that the words come to the forefront of my mind often. For example, when Bernard offers constructive criticism that I can sometimes take too sensitively I recall him pledging to me that he would “…challenge me to be the best version of myself.” I feel he and I are mindful of the promises we made to one another because they were created, just like in marriage, together. This entry was posted in Brides and tagged brides, grooms, love, Marriage, matrimony, Relationships, Vows, wedding.